Fans of cappuccino rejoice! 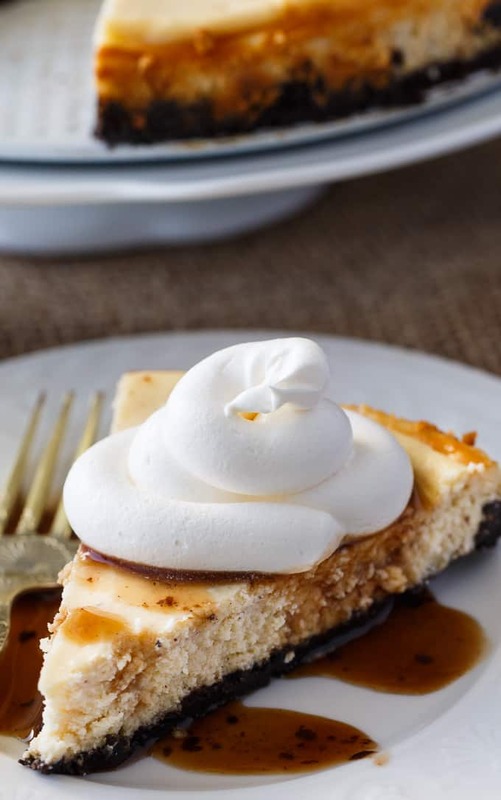 This Cappuccino Cheesecake is just what you need to satisfy your sweet tooth and get your java fix. It’s easy to whip up, rich and is always a hit with everyone who tries it. 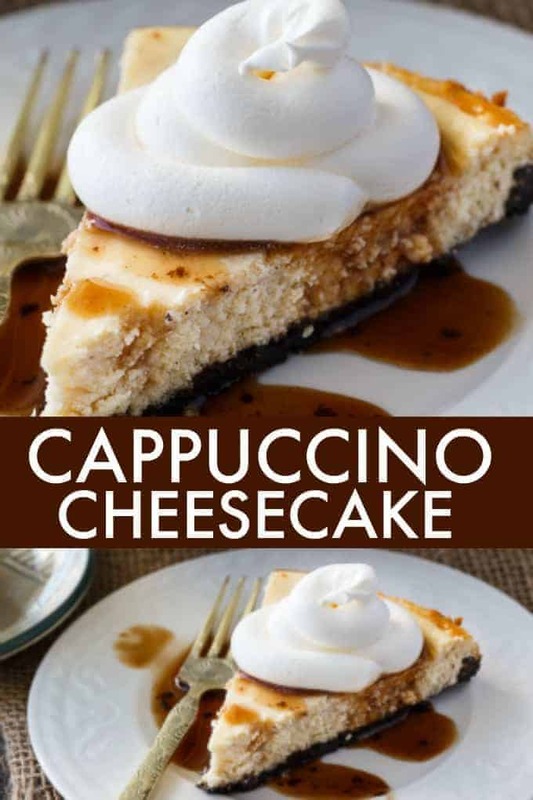 I’m a big fan of both cappuccino and cheesecake. I drink coffee daily and cappuccino on occasion as a sweet treat. Cheesecake is my weakness though. I can never resist a slice of this rich, luscious dessert that goes down too easily. 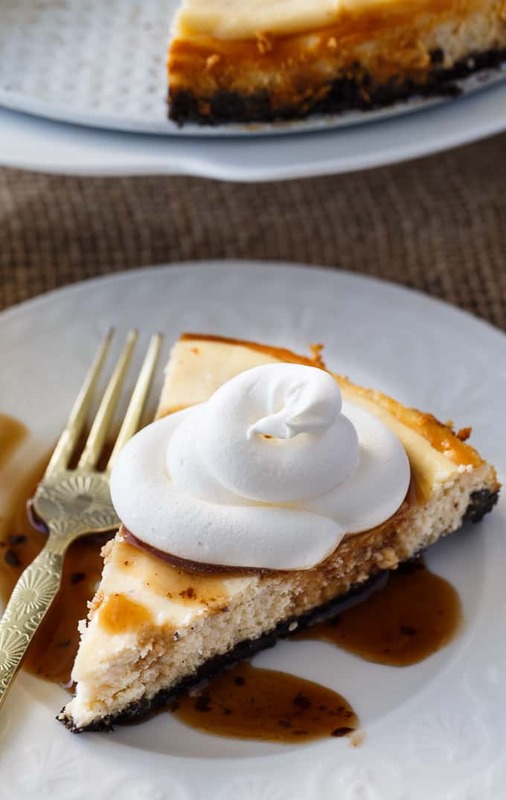 I like this recipe for Cappuccino Cheesecake because it’s not overly sweet. You know how some desserts can overpower you? This recipe strikes a nice balance. The first step is to make the Oreo crust. You’ll need crushed Oreo cookies. I bought a box of the already crushed Oreos at the grocery store to save time. Combine the crushed Oreos with melted butter and press mixture into a 9-inch springform pan. I use springform pans all the time for cheesecake. 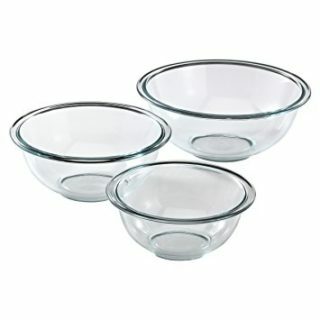 I like them because they are easy to remove and help the cheesecake maintain its perfect round shape. 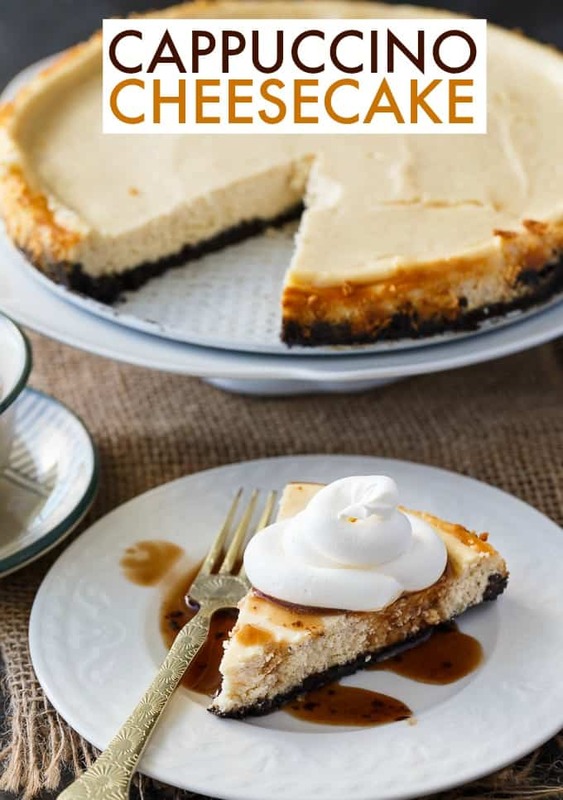 The next thing you’ll do is make the creamy cheesecake filling. 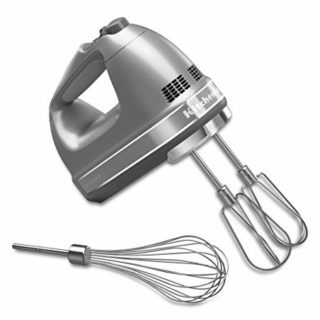 Beat together with an electric mixer the cream cheese, sugar, vanilla and eggs. Remove one cup of the batter and stir in cinnamon. In the remaining batter, stir in brewed coffee. I used the leftover coffee in my coffee maker from that morning. It doesn’t matter if its cold. Pour the coffee batter into the springform pan. Then, spoon the cinnamon batter over the coffee batter and swirl with a butter knife. I always put my springform pan on top of a cookie sheet in case it leaks. Bake for 40 minutes or until the cheesecake is set. When you take it out of the oven, do not remove the springform pan. Let it cool a bit at room temperature and then chill in the fridge for 3 hours or overnight. 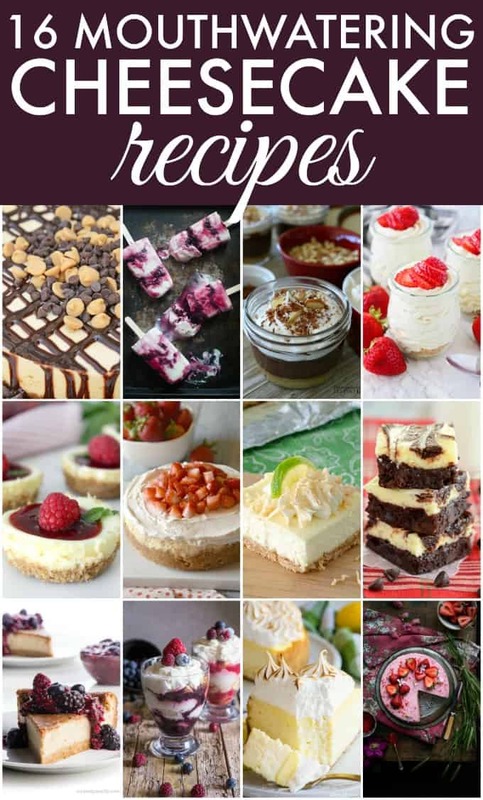 Did you know that July 30th is National Cheesecake Day? Yes, there is a day just for celebrating our love for this crazy amazing dessert! You might also like this Peach Coffee Cake. Rich creamy cappuccino flavoured cheesecake filling is nestled on top of a chocolate Oreo crumb crust. In a bowl, stir together Oreo crumbs and melted butter. 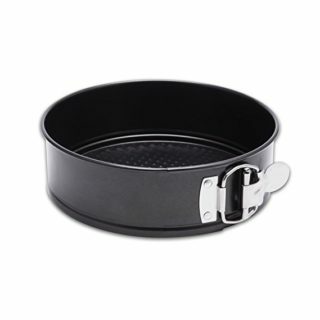 Press into a 9-inch springform pan. In a large bowl, beat together cream cheese, sugar, vanilla and eggs until blended. Remove 1 cup of batter and stir in cinnamon. In the remaining batter, stir in coffee. Pour coffee batter into springform pan. Spoon cinnamon batter over coffee batter and swirl with a butter knife. This looks delicious! 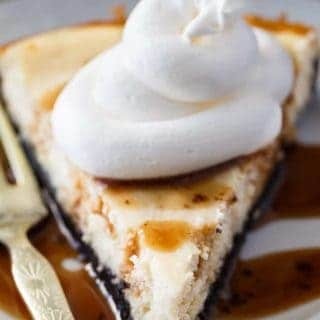 One of my favorite cheesecakes has lots of cinnamon in it! You didn’t say what you drizzled over the top of it in the picture? Is it just coffee? I found you from Mariliyn’s Treats party. Thanks. 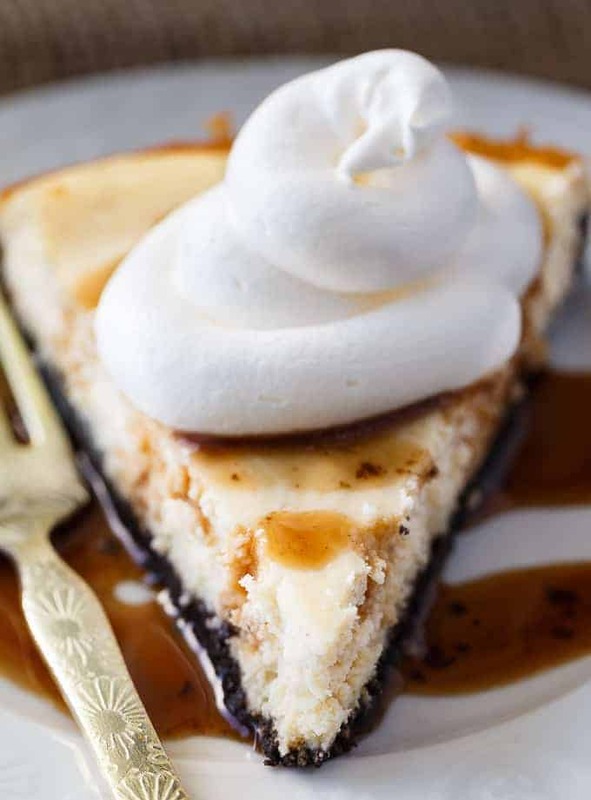 I would love a slice of this delicious Cappuccion Cheesecake right now! Hope you are having a great week and thanks so much for sharing with us at Full Plate Thursday. This cheesecake looks divine. Thank you for sharing at Snickerdoodle Create Bake Make Party. Looks so yummy! Sharing! Thank you for sharing on Merry Monday! Hope to see ya next week!